Present state: Demolished, housing now stands on the site of the station and goods yard. 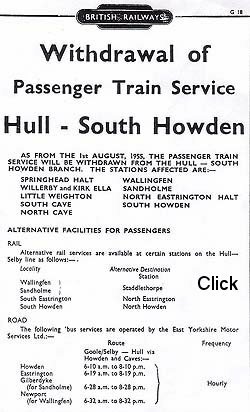 Notes: The station was originally called Howden, 'South' being added from 1 July 1922. 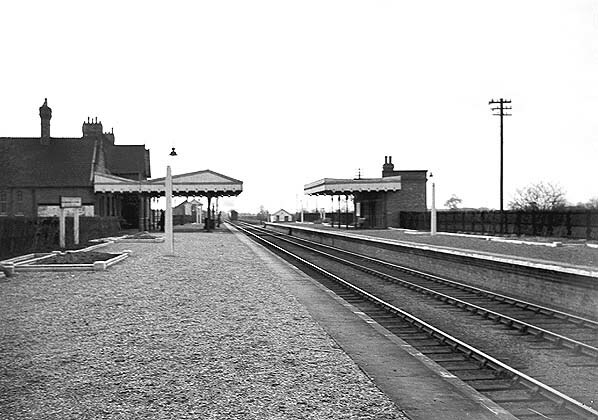 The station had two facing platforms on the west side of station Road bridge at the end of a short curving approach road. The extensive main building, grand even by H&B standards, was on the broad south (up) platform. Built of red brick its two-storey stationmaster’s house had a hipped roof from which pairs of gables stood forward on the platform elevation and facing the forecourt, while lofty single-storey sections continued both east and west. The eastern section under a pitched roof contained the office range, and it ended with a further gabled element, where the ladies’ room was found. Most of the gables carried decorated bargeboards with half-timbering added on the exterior elevation. East of the stationmaster’s house the single-storey building rose up to a plain parapet. A particularly attractive feature was the awning with a decorated valance which stretched across the broad platform. A brick waiting room with a canopy was provided on the up platform. 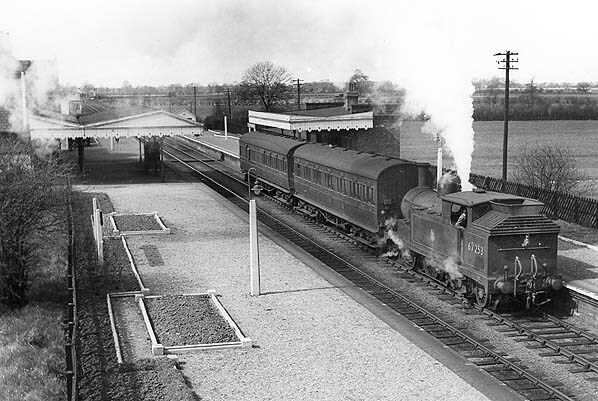 After closure to passengers on 1 August 1955, occasional excursions continued to use the station; one of these running to Bridlington on 28 July 1957. 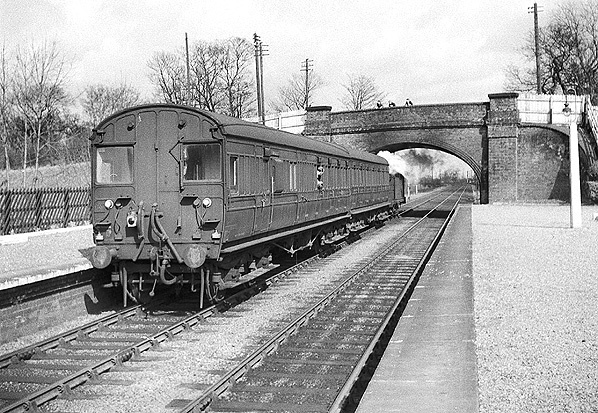 The goods yard closed on 6 April 1959. 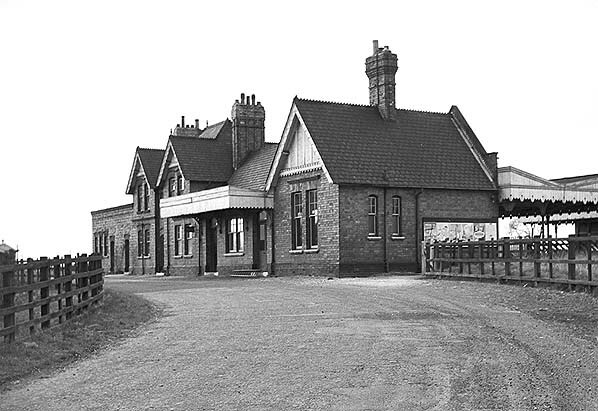 The waiting room on the down platform had been demolished by the end of the 1960s but the main station building and goods shed survived until the late 1970s when they were demolished to make way for new housing. Looking south-west from Station Road bridge at South Howden station in the first decade of the 20th century. 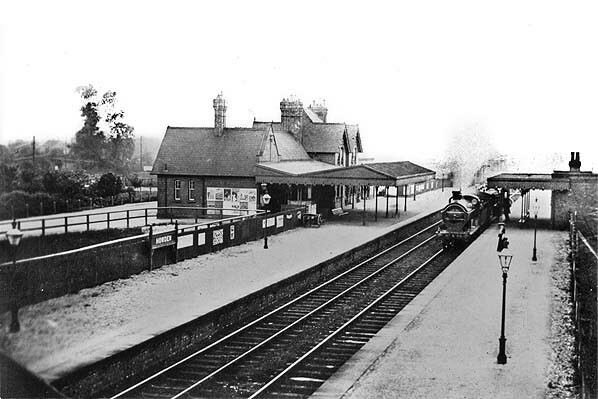 South Howden had a large station building than its neighbours, the station house having two gables facing onto the platform. The building is sited well back from the platform edge with an unusually wide canopy in front of the booking office. 1890 1:2,500 OS map shows the layout of the station and goods yard. Three sidings run behind the up platform, that closer to the main line running through a goods shed to terminate at a cattle dock. A number of sidings and sheds are also seen in the south side of the yard. One of the sheds has a short section of track that doesn't appear to be connected to other sidings. These were probably the remains of a base used by the contractors building the H&B. The railway opened in 1885; the map is dated five years later but in reality was probably surveyed a couple of years earlier, so it is very likely some builders' infrastructure remained - the isolated shed with stub rail is a typical indicator. One of the sheds was almost certainly for locos.The station had two signal boxes, one at the west end of the up platform, the other on the down side to the west of the goods yard. Click here for a larger version of this map. 1907 1:2,500 OS map - all the sidings and sheds on the south side of the yard have now gone. Click here for a larger version. Howden West track and signalling plan. Click here for a larger version. Howden East track signalling plan. Click here for a larger version. 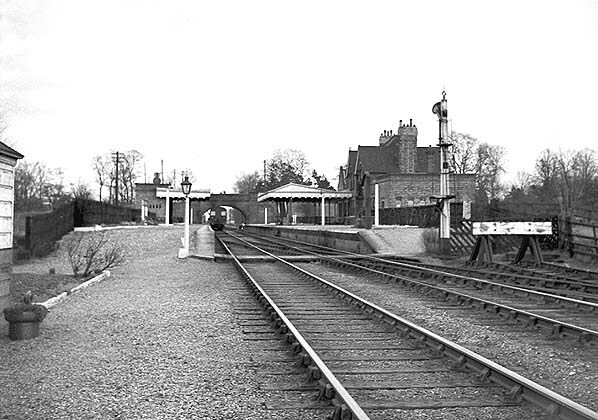 South Howden station looking south-west form Station Road bridge in the 1950s. A Hull Paragon service wait in the down platform hauled by 67253, a Worsdell designed G5 0-4-4T. Built for the NER in April 1895 at Darlington Works, it was withdrawn in October 1958 from 54A, Sunderland Shed and scrapped a month later. Note the neatly laid out flower beds - now devoid of any plants. In earlier days, South Howden was a regular winner of the best kept garden competition. 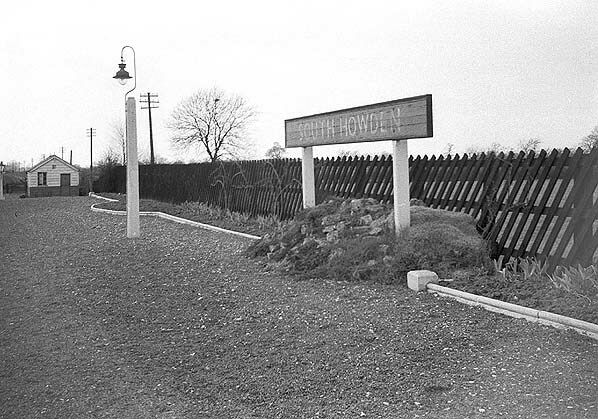 South Howden station looking west along the up platform in April 1955 a few months before closure. Note the flower beds on both platform. 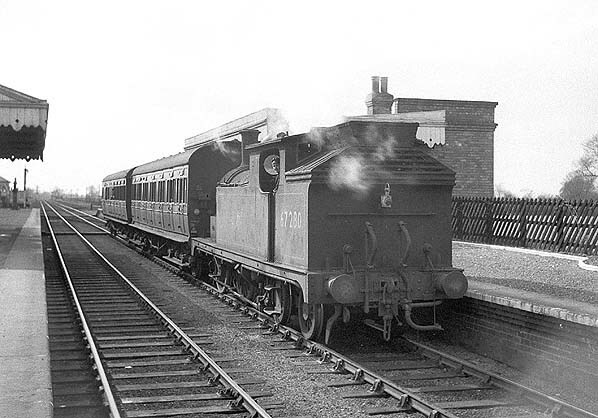 Push and pull unit in the down platform at South Howden station in April 1955. 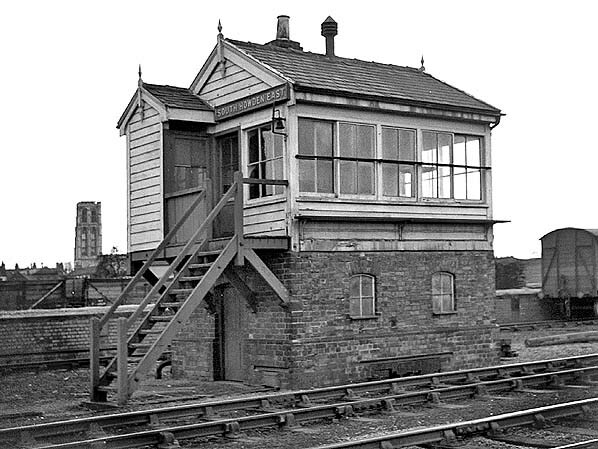 South Howden east signal box in April 1955. The cattle dock is seen to the rear. This box closed on 12 December 1939.